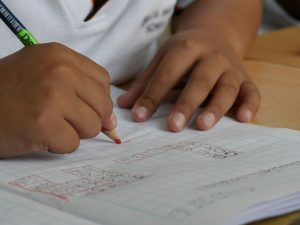 Children with dysgraphia often have a combination of fine motor delays, lack of hand and finger strength, issues with hand-eye coordination, and struggle to remember how to write letters. I worked with children with dysgraphia professionally and I have raised and homeschooled a teenager who struggled with dysgraphia. As I see more and more children diagnosed with this learning challenge, I wish I could tell every mother the things I know. It is possible to overcome dysgraphia and improve your child’s handwriting. Before you even start writing with your child, there are some foundational skills you need to put into place. These are the things to do first before you start writing. If your child has already been introduced to writing but it is going badly, back up to these skills. Overcoming dysgraphia requires a solid foundation. 1. Your child needs to have good body awareness. 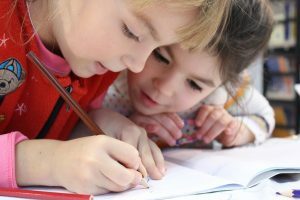 To be able to control the hand and use it for writing, the child needs to know exactly what their fingers are doing even when they aren’t looking at them. Can your child, with their eyes closed, touch each finger to their thumb, one by one? Do they bump into things? 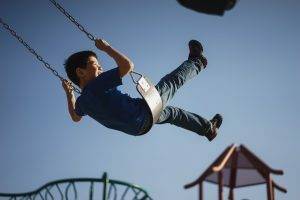 Are they “clumsy?” These are signs the child needs to do some work to strengthen the brain-body connection. How to strengthen the brain-body connection. Use playground equipment every day. Swinging. sliding, climbing and running around help develop these connections. Have your child take lessons in dance, gymnastics, swimming, or martial arts. Or play an organized sport. These activities focus on building awareness of the body and understanding how it moves while giving your child a goal to focus on. Have your child use their hands to work with lots of different textures. Knead dough, mold clay, hide objects in bowls of rice or beans, draw in shaving cream, sand, and salt. The more textures the fingers are stimulated by, the more the nerves send messages to the brain building more connection pathways. Some children are reluctant to touch things that are messy or feel different. If your child is reluctant to touch different textures, make up games that challenge your child. Work on whole body skills like riding bikes, propelling themselves on scooter boards, and climbing ropes. These complex skills make your child aware of where they are in space in a different way. 2. Make sure your child can hold a pencil with a functional grip. This skill is best developed when a child is five to six years old. But if your child’s grip is not functional, it may be worth working on changing for older children. Have your child work on holding their pencil or crayon with their thumb and first 2 fingers to create a tripod grasp. Encourage them to develop this grip by having them use short crayons or little pieces of chalk. If it is small enough, the child has little choice but to hold it with only their thumb and first 2 fingers, as the others won’t fit. Writing upright on a whiteboard, window or easel also encourages the proper grip, as most unusual grips will not work in the vertical position. If your child struggles to learn the grip, start any writing session with a low-stress activity, like coloring or a maze, where you can correct their grip before you work on handwriting. 3. Make sure your child can draw basic shapes before you introduce writing letters. The skills needed to draw a square, circle, and triangle are the same ones needed to write uppercase letters. Lowercase letters require even more precise movements with the pencil and can be worked on by learning to copy more complex shapes in drawing books. 4. Teach how to write the letters, over and over. Learning to write with dysgraphia means that a child will struggle to remember how to start a letter and which way to move the pencil. They will struggle to remember what it looks like without an example in front of them. To help your child overcome dysgraphia, you’ll want to practice making the shape of the letters in lots of different ways. This will help reinforce their memory. Write with fingers in shaving cream, salt, sugar or oatmeal. Make letters in the air with whole arm motions. Make letters with your feet. Help the brain absorb what the letter feels like. I believe in the power of copy work. I have seen it help children to develop a sense of where the letters fit on the page and how to write. It may take years but it is worth it. 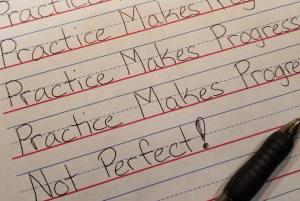 Separating the act of practicing writing from the task of thinking about what to write helps relieve some of the anxiety associated with writing. Some children may be done with copy work at age seven or eight and ready to write on their own. Children with dysgraphia benefit from practicing this skill much longer, through middle school and possibly into high school. Write the passage you want your child to copy yourself in your best handwriting. If your handwriting isn’t great, learn to do better. I mean it. You are an adult. Go practice this so you can teach it. You can do it. What to copy and how much? I recommend only giving a small amount each day or every other day as copy work. One sentence is often enough for the struggling child to work on this skill. Options for copy work include: the title of the book the child is reading/hearing aloud with author and proper grammar, a sentence from a book, a nursery rhyme, proverb or poem, an interesting fact of the day, a joke, or something you want them to memorize (like their address). Mix it up. There are so many different options. Keep it interesting. Don’t just copy the very next sentence in the same book day after day. If your child struggles with all writing you may want to take dictation and write for them in other subjects while they develop the skills of writing through copy work. You don’t want their difficulty with writing to add stress or anxiety to other areas of your homeschooling. 6. Keep working on hand strength and coordination. Most dysgraphic kids complain of their hands hurting when they write. This is due to a lack of hand strength and muscle coordination. Their hands need a work out routine. My recommended hand strengthening plan takes 15 minutes a day. Work out the fingers with Theraputty. Available on Amazon, this putty is designed to keep the same resistance through a lot of use. Most children need soft or medium resistance. Hide pony beads, coins or buttons in the putty for the child to pull out of it. 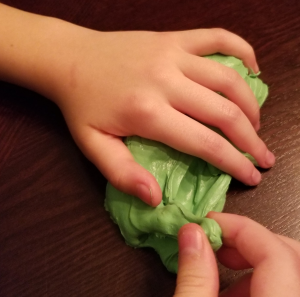 It is important to have the child hold the putty while pulling these out as it works far more muscles than letting it lay on the table. Then make the child hide them again. You can also work on squeezing, pulling, pinching and rolling the putty to work those muscles. Do wall push-ups, yoga poses like downward dog, pull-ups, bear crawls, crab walks or playing catch with a ball. I especially like using a yoga ball or playground ball. All of these will gradually strengthen the arms and hands. I know. Your kid hates it. Many kids with dysgraphia do. However, this isn’t coloring to make art. This is coloring to make their hands stronger. If your child is willing to use it, get a coloring book that has a design they like. If they feel coloring is dumb draw a series of 1” squares on a piece of paper. Set a timer and have your child color as many squares as they can until the timer goes off. You may want to start with just one minute the first week and add a minute each week or every 3rd day until you work up to five minutes. By taking out the “art” and making it more of a work out routine, middle-schoolers who would never dream of coloring in a coloring book will often work on coloring this way. 7. Introduce pencil games and visual scanning. Have your child do dot-to-dots, mazes, word hunts, hidden picture puzzles, and word puzzles to enhance their hand-eye coordination. A few minutes of these right before handwriting practice is a great time to make sure their pencil grip is correct for writing and they are ready to work. 8. Teach keyboarding skills in middle and high school. I don’t recommend giving up on handwriting. But adding the skill of typing to your child’s abilities is important so that they will be able to type longer assignments for high school, college and real life. It may take several years for your child to overcome dysgraphia. Giving her the tools to work around it is important. Keep in mind: there is no “quick fix” for a learning disability. Your child will learn at their own pace. This plan gives you the tools to help your child get where they need to go with writing. If you are interested in a curriculum that your child can use to develop motor coordination, language skills and provides copy-work, see our products page. All of the products here at Five Senses Literature Lessons, are designed to work with your child’s special needs and give them the rich and interesting education they deserve. Previous: Previous post: Magic Monday – Books! Wonderful Books! Next: Next post: Grand Opening Sale!